For most of its life, Mojang has allowed private Minecraft servers to exist with few, if any, caveats. The largest servers, like Hypixel and Mineplex, have player bases rivaling those of full independent games, as well as enough staff to create experiences that can be almost unrecognizable as Minecraft. But in June of 2014, Mojang started cracking down on private servers and limiting what made them unique. While Mojang/Microsoft are well within their rights to protect their brand and enforce their EULA, the changes have damaged the community, perhaps irreparably. Even though the largest networks remain operational, a lot of servers have shut down, and enforcement efforts are contributing to a narrative of decline. While reports of Minecraft’s death are undoubtedly exaggerated—sales are as strong as ever—we may be seeing the death of a certain type of Minecraft. Part of the reason for the popularity of private servers is the inadequate nature of official offerings from Mojang. Their multiplayer platform, Realms, has been fairly limited until very recently. It has yet to catch on in the way that private servers have, given how easy they are to set up, modify, and maintain. That’s only one part of their popularity, though. In many ways, Mojang offloaded the responsibility of community management and development to independent actors. Private servers have worked hard to foster and maintain the community that made Minecraft such a phenomenon. Without the maps, mods, and spaces provided by servers like Hypixel—features that form the basis of the most popular YouTube channels— Minecraft most likely wouldn’t be as popular as it is today. 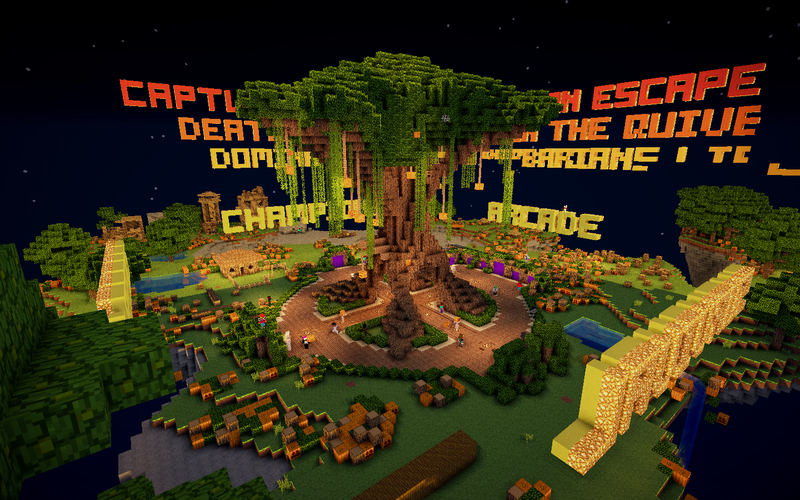 The largest of these servers provide a home for a competitive player base that prefers fast-paced PvP to Minecraft’s more idyllic survival mode, with the most popular modes such as Walls, Skyblock, and Factions being a combination of combat and building. Many players also enjoy more insular building and design-focused servers like Revand and Minecraft Middle Earth, and more still play on small private servers shared with a select whitelisted group focused on survival or exploration. The exact number of players who experience Minecraft primarily or exclusively through private servers is difficult to quantify, but it’s significant—Hypixel alone boasts 10 million unique accounts. However, it’s easy to see the influence that these servers have had on the development of the game and the community. Most of the minigames that are now popular among Minecraft’s devotees were developed and popularized on large servers like Mineplex or Shotbow. Many of these, like Battle and Tumble, have received official treatment in Minecraft’s console versions. Of course, just because private servers are free to create and run doesn’t mean that it’s cheap or easy to do so. Most servers don’t make their costs public, but a quick look at the monthly expenses of a fairly modest server like Minecraft Middle Earth shows that they can cost in the thousands of dollars. For many owners, running a private server is a full-time job. Some of the larger servers employ a full staff of developers, artists, and managers. To pay for the cost of hosting and staffing private servers, a secondary market has emerged. It sells everything from cosmetic upgrades to in-game items. Some of these microtransactions are fairly innocuous, though a certain class of server quickly developed a reputation for charging exorbitant amounts of money for titles or ranks that often preyed on minors. For a while, the largest private servers enjoyed a cordial relationship with Mojang. They had implicit or explicit permission to charge for services and use Mojang assets. In the early days of Minecon, their staffs were even invited to give talks or host panels like “Modding With the Pros” or “Growing a Server Community.” Over time, this relationship weakened, like “distant high-school friends,” as Navarr Barnier of Shotbow termed it. Then, in June of 2014, just before the Microsoft buyout, Mojang dropped a bombshell on the community. A blog post titled “Let’s talk server monetization” seemed innocuous enough, but it threatened to shatter the stability of the entire private server ecosystem. The blog post was essentially a clarification of the Minecraft End User License Agreement (EULA), but it made many common server practices, like allowing players to buy in-game currency, explicitly against the rules. There was a lot of disagreement about what exactly this meant, but the general consensus was that Mojang was within its rights to enforce these rules, which would cut down on the worst predatory and exploitative practices. For some servers, the changes ended up being beneficial. For years they had operated without any guarantee that they would be allowed to continue or what exactly was allowed. The changes granted them an air of legitimacy and moved them out of the “greyzone,” as Aaron Donaghey, Operations Manager at Hypixel, termed it. “It allowed us to make a one year plan,” he said, “where previously things were month-to-month.” Without the looming threat of a shutdown, Hypixel and other legitimate servers could run their servers more like real businesses, hiring staff and expanding. But for others, the future was less clear. The blog post wasn’t followed by any especially vigorous enforcement efforts, so most servers simply continued as they were, but the writing was on the wall. Starting about nine months ago, Mojang hired several ‘brand enforcers’ who started cracking down on EULA violations. These enforcers sent e-mails to non-compliant servers and eventually created a blacklist of the worst offenders. Some servers that were previously in good standing were caught up in the purge. Hypixel had done away with all of its EULA-violating practices when the announcement was made, but it received a strongly-worded enforcement letter telling it to remove the horses it provided as rewards to donating players, even though those horses were purely for use in the lobby and provided no gameplay benefit. Despite having an existing agreement with Mojang and an understanding that their server was in compliance, the Shotbow network recently received an uncompromising message from the Microsoft enforcement team telling them to remove their soft currency, Shotbow XP, or be blacklisted. Even servers with large numbers of players have struggled to stay afloat after the changes. High-profile servers like Overcast Network, which was bought out by Pocket Edition mega-network Lifeboat, or Mineplex, once dominant but now plagued with rumors of player and server decline, have struggled. Some servers have even turned to extreme measures, distributing cracked launchers or running bootleg versions of Minecraft to avoid being targeted. Others have simply decided not to update and continue running increasingly outdated versions of Minecraft rather than try to meet Microsoft’s expectations. But for other servers, regardless of their legal standing, switching their funding models would mean shutting down entirely. Though Mojang has made attempts to work with their community, their enforcement of the EULA has been inconsistent and unevenly applied. Some servers have received harsh punishments, while others have been ignored. Some large, healthy servers have had to scale back or close down, but many servers with paid ranks and items continue to operate, apparently without consequence. “The door for dialogue is opening,” Donaghey admits, referring to recent communication efforts by Microsoft, but the damage may already be done. A lot of Minecraft’s older player base has the sense that Mojang/Microsoft have abandoned the people that made the game popular. These are the people who put in the hours nurturing the community, creating the content, and building the popularity of Minecraft as it is today. It’s also hard to not be cynical about how Microsoft is approaching this, given that they are borrowing heavily from the community to create new game modes and pushing an alternative hosting model. After years of leaving large chunks of responsibility to private server owners, many feel betrayed by the increased pressure and lack of communication from Microsoft and Mojang. While Minecraft’s owners are clearly hoping that they will be able to stamp out non-compliant servers without too much impact, it may be harmful to the future of the game. The pre-2014 server environment was a rich ecosystem of innovative mods, maps, and game modes, but innovation has slowed considerably today. Many luminaries of the community, like the Yogscast crew, have largely taken their talents elsewhere. [Correction- 3:26pm: We initially named CPW as one of the developers who is no longer involved with Minecraft. That is not the case. We apologize for the error.] There’s also the risk that as these long-standing communities shrink or disappear, players who inhabited them will simply move on to different games, rather than move to Realms or to a compliant server. As Microsoft continues to push Pocket Edition and console editions while neglecting the original Java edition and its community of creators, it feels to many like Minecraft is making a shift to a more structured, corporate model. This has some benefits—more polish, better support, frequent updates—but it’s not clear that they outweigh the loss of diversity that made the game such a monumental success in the first place. Minecraft might not die, but if things continue as they are, it might not be the same game.